The glass hatch can be opened using the glass hatch opener. press the button to pop up the glass hatch. The glass hatch cannot be open when the back door is locked. Unlock the back door to open the glass hatch. when the back door is unlocked: press the button to pop up the glass hatch. When the back door is locked: while carrying the electronic key on your person, press the button to pop up the glass hatch. The back door is closed. open the glass hatch slowly and carefully. Make sure that the rear window wiper is switched off. 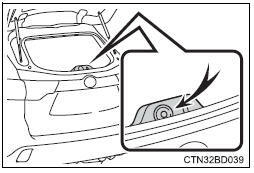 Do not rotate the rear wiper arm when the glass hatch is open. 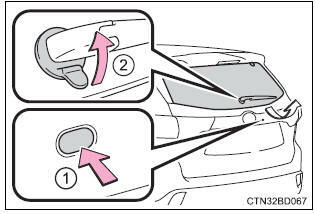 (If the rear wiper arm is rotated, turn the wiper switch on after closing the glass hatch. Make sure that the back door is closed before closing the glass hatch. Check that the glass hatch is firmly closed. 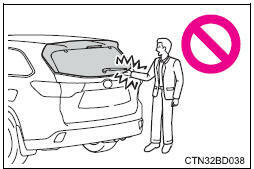 If it is not firmly closed, the rear window wiper and washer will not operate correctly. When all doors are locked, closing the glass hatch with the electronic key left inside the luggage compartment will sound an alarm. In this case, the glass hatch can be opened by pressing the glass hatch opener. If the spare electronic key is put in the luggage compartment with all the doors locked, the key confinement prevention function will activate and the glass hatch can be opened. In order to prevent theft, take all electronic keys with you when leaving the vehicle. If the electronic key is put in the luggage compartment with all the doors locked, the key may not be detected depending on the location of the key and the surrounding radio wave conditions. In this case, the key confinement prevention function cannot be activated, causing the doors to lock when the glass hatch is closed. Make sure to check where the key is before closing the glass hatch. make sure that the glass hatch is fully closed. If the glass hatch is not fully closed, it may open unexpectedly while driving and hit near-by objects or luggage in the luggage compartment may be thrown out, causing an accident. Do not allow a child to open or close the glass hatch. Doing so may cause the glass hatch to move unexpectedly, or cause the child's hands, head, or neck to be caught by the closing glass hatch. Remove any heavy loads, such as snow and ice, from the glass hatch before opening it. Failure to do so may cause the glass hatch to suddenly shut again after it is opened. When opening or closing the glass hatch, thoroughly check to make sure the surrounding area is safe. If anyone is in the vicinity, make sure they are safe and let them know that the glass hatch is about to open or close. Use caution when opening or closing the glass hatch in windy weather as it may move abruptly in strong wind. The glass hatch may suddenly shut if it is not opened fully. It is more difficult to open or close the glass hatch on an incline than on a level surface, so beware of the glass hatch unexpectedly open or close by itself. Make sure that the glass hatch is fully open and secure before using the luggage compartment. Also pay attention to your personal belongings such as bags and ties. When closing the glass hatch, take extra care to prevent your fingers etc. From being caught. Also pay attention to your personal belongings such as bags and ties. When closing the glass hatch, make sure to press it lightly on its outer surface. Do not pull on the glass hatch damper stay to close the glass hatch, and do not hang on the glass hatch damper stay. 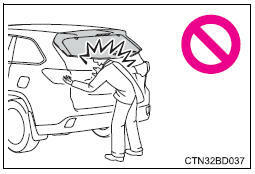 Doing so may cause hands to be caught or the glass hatch damper stay to break, causing an accident. Do not attach any accessories other than genuine toyota parts to the glass hatch. Such additional weight on the glass hatch may cause the glass hatch to suddenly shut again after it is opened, resulting in death or serious injury. Do not insert any object in the wiper motor drive disc. Do not close the glass hatch while the rear wiper is switched on. 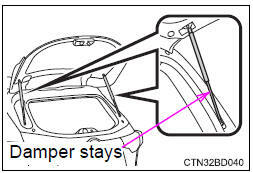 The rear wiper arm may be restarted suddenly after closing the glass hatch. The glass hatch is equipped with damper stays that hold the glass hatch in place. Observe the following precautions. Failure to do so may cause damage to the glass hatch damper stay, resulting in malfunction. Do not attach any accessories other than genuine toyota parts to the glass hatch. Do not place your hand or foot on the damper stay or apply lateral forces to it.